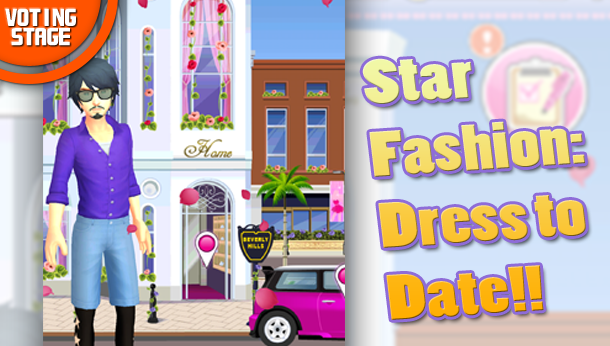 Star Fashion: Dress to Date | Create Game Ideas! Would you like to have a girlfriend/boyfriend who is as fashionable as you are? Star Fashion: Dress to Date could make your dreams come true. Star Fashion: Dress to Date is not just a fashion game but also a new age social platform targeting people who love fashion. Play as a male or female avatar and flirt with girlfriends/boyfriends! You can even make friends with other players of this game through chatting and sharing fashion ideas. Work as a virtual singer, dancer, sports celebrity or model in the pursuit of fame! The road to superstardom requires fabulous stilettos, high end designer clothes, snazzy accessories, and glamorous hair! Hone your skills at various activities, including singing, ballet dancing, and tennis! Perform well and you will be catapulted to celebrity status. Rising stars need to socialize and be seen, so hang out with your fellow celebs and go on dates around the town. Don’t forget to take snapshots of your posh lifestyle, and share them on Facebook and Twitter! Can’t wait to try this? Please vote for this awesome fashion game and social platform!